Since Korriban can be very difficult if you just barely left Dantooine, and since Bastila will also be unavailable for the duration, I suggest that you come here last. Like the other planets once you land here you need to pay a fee, though it is considerably less here (only 25 credits), and this can be bypassed easily enough with an easy persuade check. From here on forward there are many opportunities for both dark and light side points, so make sure you check the Korriban Dialogue Page. Our first goal here is to get in to the Sith Academy. Go forward and you'll meet Shardaan who is threatening various idiots with death. Choose whatever fate for those morons you wish and continue forward to meet Lashowe. If you don't cause her to hate you it can be slightly easier later on for the side-quest involving her, but it doesn't matter so say what you will. Talk to the people here and you learn that to enter the Sith Academy you need to meet Yuthura Ban. Continue forward to the Entrance of the Sith Academy, and the Guard will tell you that she's in the Cantina, and that you'll need a medallion. You can actually enter the academy without a Medallion if you make a persuade check when talking to Yuthura, however getting the medallion results in additional opportunities for LSP or DSP so I usually get it. Also it can be difficult if you are light sided if you don't have a medallion, since it requires that you pass a hard persuade check to enter. If you've already been on the leviathan an additional dialog option will be available allowing you to enter regardless of your alignment, with or without the medallion. If you do decide to get a medallion, there are two groups that you cannot avoid that both have medallions. You can avoid fighting the first group for LSP, but the Second Sith that has a Medallion will try to kill you no matter what you say. After getting a medallion talking to the prospective Sith students can net you LSP or DSP if you wish. Anyways when ready to enter the Academy talk to Yuthura for 1000 XP. With medallion in hand you are guaranteed entry. Note that if you try to persuade her that you want to become a Sith without using the lie option you will gain DSP. Listen to the introduction speech and reply as you wish as there are no consequences of any dialog choice at this time. You'll start out next to your bunk, and Yuthura will talk to you when you try to walk past her which will net you yet another 1000 XP. She asks you to betray Uthar at the final trial within Naga Sadow's tomb. You don't really have a choice at this time, but you can always turn on her later on. You can befriend her at this time, which will give you additional dialog options later on if you wish. You will now have free access to the Valley of the Dark Lords, as well as the Sith Academy. 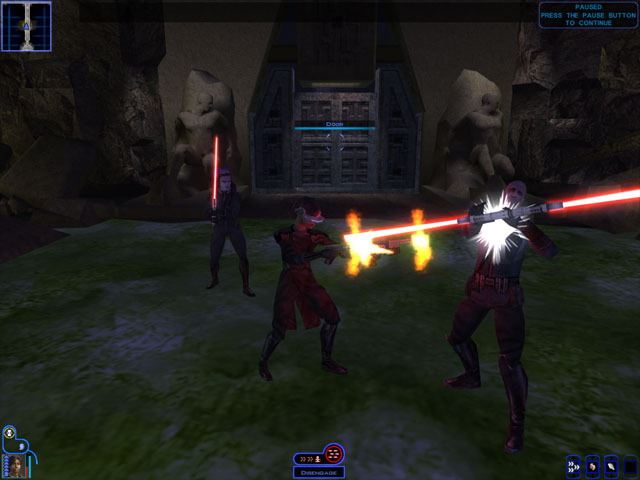 Note that on first entering the Valley of the Dark Lords you may encounter Calo Nord or Darth Bandon waiting for you if you have seen their cutscene. For strategies on dealing with these idiots see my "Big Bads" page on Calo or Darth Bandon. Betray Kel +1. Always Nets DSP. Prisoner's weapon cache +1. Always affects alignment. Kill Lashowe +1 (if she took the holocron). Always Nets DSP. The above sidequests are outlined in more detail here. Note that many of the above side-quests can only be completed before you enter the tomb of Naga Sadow, and as such you should complete as many as possible before talking to Uthar. You not only gain reputation with Uthar, these side-quests provide XP and many of them also provide DSP and LSP opportunities. In fact this Korriban has the most opportunities for LSP out of all of the planets you have visited thus far. If you want to maximize the XP you get you'll want to make sure you report the Code of the Sith, Yuthura's Betrayal, as well as give Lashowe's Holocron. Make sure you do the Holocron Last, and only after you've gotten 4 prestige points. This way you can gain 6 points instead of the normal 5, and gain the extra XP for it too. Anyways report everything to Uthar for an extra 210 XP, after which you'll be taken back to your bunk. Note that once you enter the Tomb of Naga Sadow, your party members won't be there to help you, so it is in your best interest to come back later on if you can't solo powerful enemies. Also before you talk to Uthar to move forward, you may wish to place your companions near the entrance to the Valley of the Dark Lords using solo mode. Remember that you can't turn back once you enter, you must reach your goal the Star Map and get the Sith lightsaber before you can leave this accursed place. Make sure you are ready before entering. Once your preparations are complete talk to him again to be taken automatically to the Tomb of Naga Sadow. While the Star Map is straight ahead, a river of acid like substance blocks your progress. To cross this you need to get an item to the west. R to L M to R L to M L to R M to R.
L= Left Pillar, M= Middle Pillar, and R= Right Pillar. Read from Left to Right, Top to Bottom. Anyways head to the westmost room, and save before entering. This is where you can get into trouble as you have to face two Terentateks all alone. They also have an innate resistance to force powers though it can be overcome without too much difficulty. Their melee attacks do large amounts of damage, and they both have plenty of vitality so they can be quite a handful. Debilitating them first before doing anything is advisable, and consulars especially need to stay at arm's length from them. Insanity works better here than Stasis Field, as they only have a will save of 5, vs a fortitude save of 13, but either should work if your Wisdom is high enough. Do not use Force Whirlwind as they are immune to it. There is one trick that you can use if you are having trouble with them, especially if you're trying to face them on lower levels. First, make sure you can run quickly, using either burst of speed, or an adrenal alacrity. Either debilitate them if you can or run past them and switch the lever. Afterwards open the door to the next room and enter as quickly as possible. Once inside, the beasts do not follow you, which means you can do ranged attacks against them at your leisure, changing this difficult battle into a cakewalk. However you deal with these two beasts once you take them out search the skeleton in the room for the most powerful lightsaber crystal available, the Solari Crystal. This may be your only chance to get it so make sure you don't miss it. Anyways hit the lever in the corner and proceed forward. Go to the far pillar and get the ice grenade. You won't need the fire grenade in the other pillar so ignore that as it can end up costing your life if you make a foolish mistake. Go ahead and chuck in the ice grenade and you'll be able to cross and finally gain access to the Star Map ahead. Again do NOT throw in the fire grenade as that will just get you killed. Anyways go ahead and get the star map for 250 XP. Behind the star map is a statue that contains the Sith lightsaber. Make sure you heal up and make any last minute preparations for another upcoming battle. This is where some of the fruits of your previous betrayals and such come up. After listening to the blathering of master Uthar for 840 XP, you get to choose your enemy. While there are various different combinations of what you can do related to that side-quest, the results can be boiled down into just four categories. Since poisoning Yuthara is optional in all four cases, and poisoning Master Uthar is optional for all but the first path, I often choose to poison both of them as it makes for better conversation. Outlined below are all of the paths resulting from the previous choices that you have made. Tell Master Uthar of Yuthura's plans. Not tell Yuthura of Master Uthar's Plans. Side with Master Uthar during the final test. Side with Yuthura during the final test. Convince Yuthura to think about her path, after she betrays you. Requires a medium persuade check if you are not lightsided. Not kill Yuthura after she betrays you. Both Yuthura and Uthar die, The Academy beomces hostile, and possibly gain DSP. All choices that diverge from the above three paths will converge with this one. Remember that once the Academy becomes hostile towards you, you will no longer be able to enter the Academy once you leave. 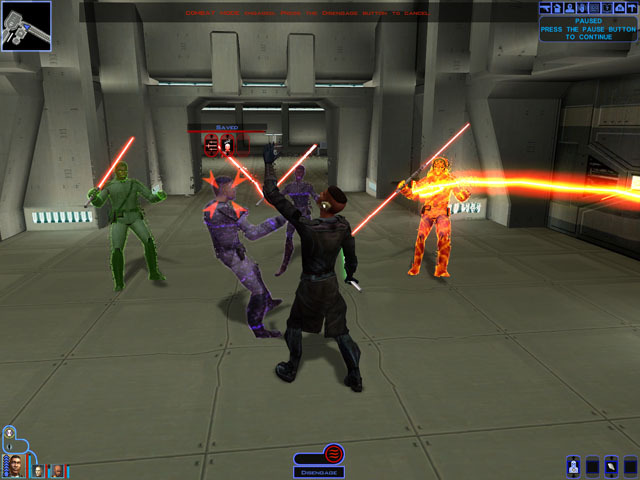 Since all of the Sith become hostile, this means that Dustil will also attack you on sight preventing you from finishing Carth's Side-quest, unless it has been completed already. While most choices result in either a DSP or LSP gain, there is one way to remain neutral, but it results in the Academy becoming hostile to you. To do this one must not befriend Yuthura and choose the "I choose me." dialog option. Afterwards say "I used you both" or "My mission is to defeat Malak" or "I did what I had to". This should result in no gain of DSP or LSP. Now that you've finished gotten your star map, head back to the Academy. As for now the people in the valley are not hostile. If you caused the Academy to become hostile as listed above, you will find three Sith apprentices that will question you and will try to kill you. Once they are dead, everyone in the valley will become hostile, as well as those inside the Academy. Prepare for battle, and re-enter the Academy. Your companions will rejoin you, but they will be where you last left them, which is why I gave the advice to place them near the door. If you didn't do as I suggested you may wish to regroups ASAP to prevent them from being overwhelmed by enemy numbers, especially if you had Jolee or Mission in your party. Clear out all of the enemies here, including a new buch of Sith and a Sith Captain near the exit. Perhaps this may be the only place where mines might possibly be useful since you can lay them out beforehand, but still many of the guards just shoot at you and won't come running towards you so their use is limited. Anyways there isn't much else you can do here. If you made Yuthura the new Master of the Academy then you can tell the Sith Duelist to release all of the captives for some LSP so long as you haven't used all of them, but other than that as long as you have already completed the side-quests prior to taking your final test, there shouldn't be anything left to do here. Go back to your ship and select your next destination. If this is your last planet then you may want to read the warning at the top of the Unknown World walkthrough before proceeding. Korriban is somewhat of a mix beteween Tatooine and Manaan. 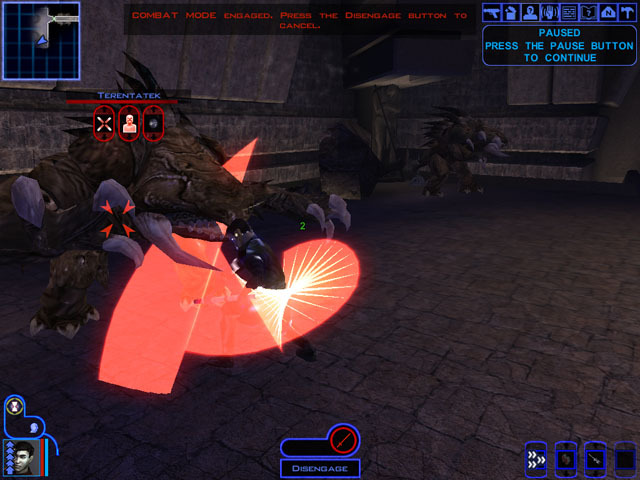 The most difficult encounters do not vary by level, while the easy enemies do. This makes it possible for low level characters to finish large parts of Korriban, while spectacularly failing on the most difficult. In fact I recommend that you do Korriban last for that reason. Doing it first is possible, but very difficult, unless you know what you're doing. Juhani can actually outshine Jolee here, since there are so many force resistant enemies here. Melee and Attack builds: For the most part the Shyrack are easy to defeat, though they swell in numbers quite rapidly. The Tuk'ata on the other hand can be a bit more of a handful. Still they should not pose too much of a problem so long as you don't do anything foolish. The Terentateks on the other hand can be a serious pain. The one in the caves has an ability similar to force push, which can prevent your characters from making any attacks. All of them are resistant to force powers and hit VERY hard, meaning you'll want to take them down as soon as possible. Taking them both on at the same time can be suicidal if you don't do some planning. First debilitate whenever possible. Horror works especially well for this. Also don't be afraid to run away if you get low on vitality. Attack first if possible. The Jedi guardian force jump ability is very helpful in this. If lucky you can take out a large chunk of it's VP in a single hit. Melee builds should have less of a problem than consulars though. Consulars: Korriban is going to be your problem planet. Melee builds might be able to do this planet without too much difficulty even in the low teens, but for consulars it is a very bad idea. The Tuk'ata will be the bane of your existance. On low levels you may find it impossible to get any of your force powers to hit, as these guys have a very high innate resistance to it. This is where throw lightsaber comes in handy. It is the only power that is guaranteed to hit, and it does so consistantly. Even so, on low levels the damage done is pitiful, so I strongly suggest that you don't do Korriban unless you are at least level 15, if not higher. Even worse are the Terentateks. The one in the cave is difficult enough, but when you have to solo two in Naga Sadow's tomb, it is a nightmare. Force powers are resisted or saved against regularly enough even at higher levels. While at level 20 they pose little problem, they are still very dangerous opponents at level 15. The ability to debilitate them is a must if you want to take them out as a consular. Having either stasis field or Horror is not just a luxury against these bad boys. They hit on average for about 25 points, but with two of them that means it can take down a consular with 100 VP in two rounds, not even considering what happens when they critical hit!